So...with electronic lights... at what point do you raise the gun?? Where do you take up your initial point of aim.? On the X, as opposed to the backer edge..?? Train all year on turning and then shoot the Nationals non turning lights.. The records will not be the same. This is 2013.. As a machinist/mechanic I can't imagine an upgraded turning target system as a major engineering feat. I agree with the Canton/Perry relationship, and it should be preserved.. In my 50 years of observing this game, I see competitors and participants. The competitors, at all costs, are very serious about this game. Participants, come and go. If NRA plans on subsidizing these electronic targets to be the future of Bullseye, and we eventually train on electronic targets and lights at most of our matches, perhaps the much faster pace (because no time will be wasted on scoring) will draw participants back from the action/cowboy shooting world. Honestly we could do a 2700 in 2 hours with these electronic targets. Denny, is there a way to convert just one of the ranges over for electronic targets in 2014, and make those firing points elective? Maybe participants could shoot on the old style ranges during the normal schedule, then whenever they have off time, they could sign up for an additional 2700 on the electronic targets. People are resistant to change. If we are given the choice at first, the resistance will be lessened. I'm starting to get used to this idea. We would get more participants at Nationals (or Canton for that matter) if there is a shooter selected option to crank out some of the competitors in just a couple hours using the electronic targets so they can complete their national match in a single day--leaving the option to do the .22 day, CF day, and .45 day format as the "traditional" option. If there is a "no fair" argument--that the competition isn't the same, and the scores are "different"--you are going to have that no matter what. Someone who shoots a record at their state match is shooting under different conditions than they would on electronic targets. Some of the HM shooters shoot their best stuff at Canton with the Camp Perry scores down from the week before--that never ruined the show for the National Matches! The Nationals ARE different--if it's going to be different because of the targets, or because Camp Perry is Camp Perry wont really matter. If the argument is that the shooter on electronic targets that could have the option to shoot the entire 2700 in one day has some sort of "advantage" over the shooters who do it the 3 day way....I would call BS--conditions at Perry are the luck of the draw. If either group had more favorable conditions, it was their lucky day--as usual. Shooters can adapt to any range, any situation. That's part of the game. My main concern is equipment being shot up by jerks (you know what I mean). Can the targets handle hardball impact. The 7 oclock area better have double wall construction. A previous post from Denny said they can handle hardball hits to the edges. Before everyone here has Camp Perry converted to electronic targets, please remember that this is only in its planning stages. I have to convince the NRA Finance Committee that this is a worthy project and I can only do that if the manufacturers can show me that they can meet our specifications. I am in contact with a number of these and we should get something in concrete soon. Our specifications will consist of everything mentioned in this thread, plus a lot more. We also know that these won't be maintenance free and costs will be involved. However, I believe that these costs will probably be neutral when compared with the costs that we currently have with our old system. The number of volunteers, etc., will be far fewer than we currently have. Rather than manning four ranges, we will only need to man one. That saves me lodging, per diem, and travel for volunteers resulting in a cost savings. The remaining personnel could be offered RSO training and some volunteer upgrades to become our "professional" range staff. I'm hoping that the cost savings will be such that we can reduce entry fees, if you don't mind. Now to a current topic. Pending before the Pistol Committee is a proposal to add classes of firearms to pistol competition, similar to what is used in Bianchi Cup competition. The firearms that most people are shooting today would be classified as "open" firearms. Additional classes might be "production", "metallic sight only" and/or "revolver." Any thoughts? The Pistol Committee will be discussing this on the 26th of this month so a little feedback from you would be nice. i would think a new modern conventional system would cost less to build and require little maintenance , the original system has been worn out for many years but how many years did it run fine before getting this bad, 20-30? A electronic system will be lucky to last 10 years, and be obsolete in probily what 5? look at how these type items evolve, who uses a cell phone, computer, camera or a mired of other things made 10 years ago? I think the electronic system will be a mistake and cost in the long run many times more than a standard system, yes maybe you could herd people thru faster but it would be at the cost of the cultural heritage of our sport. just my 2 cents. Please communicate with the pistol committee that it will dramatically increase cost to compete if we include "sub classes" that differentiate between "stock" or "production" guns and "open" or "modified" ones. It's so difficult to tell if a 1911 is stock or has been modified to look like it is stock with production parts. Most match directors may also mistake certain stock production parts as modified. If a factory shop did any hand fitting during quality control, that gun might get DQ'd as "open" even right off the shelf. Sub classifications for "Iron sights" "open sights" or "revolver" might be fun and very easy to police. Please advise the pistol department to avoid any rule changes that might have grey areas for enforcement. Match directors in the field have a difficult enough time administrating the smaller matches without needing to put 3+guns per shooter through tech inspections. We have enough classes already. The nra just added the probationary class, that should be enough. It address the shoot what you got idea well enough (imo) and they get classed different then if they want to move up to real bullseye they can. Bullseye is a sport where it has been proven that iron sights are not a hindrance from setting records. There are also people who have broken 2600 with a revolver. If the NRA wants to give out additional awards for high score with iron sights and/or revolver I would be in favor of that but as an overall award. Not Master Revolver, Expert Revolver, Sharpshooter Revolver, etc. The CMP does recognize high scores with a 1911 and Beretta for some of their matches. I have enjoyed BE since the late '60's. I'm unable to compete anymore due to health so you may want to consider that when evaluating my comments. I would be against adding additional classes as making it difficult for the small matches. Additional classes for iron, and scoped might be a good idea but only in large matches say over 100 competitors and or NM's or (large) regionals. If it is decided to use an electronic system @ Perry I would strongly advise, as have others, that some kind of movable system be obtained and used at various matches and areas around the country to initiate as many as possible. If one range is set up could say the warmup & .22 (for the record) be fired on it? Where is the CMP in all this? Has anyone talked with the range engineer? He has some 30 years of experience and his thoughts should be of value. If a system has any weaknesses "ball" would be a test. I understand economics might preclude the "one range" suggestion but am curious about the CMP and mixing electronic systems with hardball. The last few yrs I have worked as a vol RO at our club's public range. I have heard a lot of "action" type shooters talk about last weekend's matches and the conversation always revolves around the rules and the VARIETY of interpretations by the different ranges, their officers etc. NEVER have I heard comments about scores and this or that shooter. The BE guys would talk about who fired what score etc or maybe who now used a scope or maybe a revolver. I think BE should avoid that. As I said I have shot BE since '68 and have enjoyed, and been frustrated by it. The lessening of participation is disappointing. I have been confined to a wheelchair since '69 and returned to BE in '70. With the help of fellow shooters I have been able to compete from club leagues up to the Nationals. The NRA has thoughtfully provided a system whereby a handicapped person can compete and it is not a small thing. I hope the faithful can hang in there and when some of these run and shoot boys are no longer boys they will join the fun! As far as costs go, set the fees appropriate to what is needed. Tell us, the vendors and other industry people what is needed and lets see what we can get. But I'd rather not change just to reduce costs at the expense of something very dear to a lot of people. I would not like any additional classes, rules, or other changes that make it that much harder or complicated for a match director or line officer to run a match. For many years I've heard every hair-brained idea for "increasing participation" and "getting more shooters" and basically 99 out of 100 of those suggesting things don't work or run matches. If you want more shooters, get off your butts and run more matches. As I've said before, don't wait in your cornfield for somebody to ask for a match. If you're got a better idea, run some matches and let's see how it works. Then we can decide on changes. I'd like to keep bullseye as it is, not because I'm a stick in the mud. But because it's hard, its supposed to be hard, its supposed to bring out the best in the shooters, not just bring out more shooters. The NRA already has several types of programs and awards that promote the beginning target shooter. So what's the problem with them? People don't put on these matches, thats what. Please don't piggy back off existing matches and levels to try to generate "more shooters". There are millions of them out there and they need beginning training and matches, not different bullseye matches. And finally, to be a little self serving but to express my feelings for the match, here is the the Camp Perry tribute (again). Denny, thanks for everything and please don't take anything the wrong way. I appreciate and support your efforst to gather our input, improve the sport and balance a whole bunch of differing opionions (from a very opinionated crowd). No matter what happens, I expect we'll see a measured, planned and thoughtful proposal, because I know you are that kind of guy! Thank You! Welcome to Camp Perry. My silent guard towers and stately flags are there as your honor guard to greet you. My history is rich with tradition, honor and celebration. I do my duty to help guard your nation. My grassy fields, humble huts and silent berms await you. If you are a visitor, please walk my streets and note the names from our country’s proud past. Read the names of ships that sailed by canvas and the strength of men. Note the names of my ranges and tell the stories of those brave men that did not return. Listen to the quiet in the chapel and the whisper of the wind under the trees. Walk the streets of commerce and mingle with the crowds. The silent names upon my trophies are there for you to say aloud one more time, and so remember their achievements. I am here for your pleasure. Please cherish your memories of me and the time spent here. You will leave your footsteps upon my ground. If you are a shooter, you will stand upon my back and know the joy of shooting, alone or with your friends. My targets await you. Standing in line, silently, they are there for you. Twenty-five, Fifty, Two-hundred, Three-hundred, Six-hundred or One thousand yards, they set the boundaries of your world. They will record your efforts, silently and without judgment. You will smell the smoke, hear the roar of the cannon and see the colors rise each morning. You can say you were here and remember your time with me when you are old and gray. You will return to your home with stories and pictures and memories of me and leave your footsteps upon my ground. If you are a competitor, I await you most of all. My sunny sky can become blistering heat, my gentle winds can be gales of terror, my cooling rain can become a torrential deluge, my green field can be a quagmire of mud. I will be the ultimate test of your ability, training and desire. You have chosen to compete, against yourself above all others, here between the land, the water and the sky. I am here for your challenge and when you are done you will also leave with stories and pictures and memories. You will leave your footsteps upon my ground. But unlike the others, you will take with you the knowledge that you came, you shot and you competed with all your heart and soul. You, among all that come, have the potential to walk upon my stage, put your name upon my trophies and set the goals ever higher. My price for this is great. A part of your heart and soul will remain, to be held in honor with those that came before and will come after, guarded behind my gates and silent towers. And you, you will be forever destined to return each summer, if only in your dreams. Not being caught up in tradition, I don't have any desire to keep things the way they are at Camp Perry. With that said, I can't think of anything radical to make it better. Electronic targets would be fine by me, the only problem I see is that it would speed things up, perhaps too much. I am only in my 50s, but shooting non-stop through a 2700 match would be tough to do. The time it takes for scoring is the time it takes for me to rest my arm as well as my brain. A fast pace would certainly add another aspect to the sport that may be difficult to deal with. Covered firing points would be my primary request for change. Yeah, I know, it is an outdoor sport and a shooter should be in the elements. However, many of the matches I shoot at here in the midwest have covered firing points and I can't ever recall of anyone complaining about them. The goal of a fast pace with the end result having more time to shop and socialize isn't high on my request list. Like most shooters I know, we plan a vacation around the event and spend the whole week there. We go to dinner each night, eat lunches together, gather in various locations to B.S., frankly there is plenty of time for the social aspect of the sport. The only thing I can see that would have a strong impact on increasing desire is more money for winnings. Most current shooters are happy with bragging rights when winning or placing high. I know if there was a chance to win 10 grand for first place expert, I would have a bit more motivation to go to the championship and compete. As for the mud, wind, rain and other interesting conditions at Camp Perry, I can do without it. However, that is unrealistic. This past years mud fest was misery for me, however, my fellow shooters, especially Steve T. could always find a way to put a positive fun spin on it. It is that sense of sportsmanship that amazes me each year at Perry keeps me wanting to go back. Kudos to the real sportsman who look past the icky parts and focus on the fun parts of this sport! Honestly, I don't see anything wrong with Bullseye as the reason participation is not what it used to be. There are so many more choices for people to amuse themselves these days. All old activities are losing participants. It's just part of the progression of time. If the new electronic targets don't turn, I'm not interested. Well im a bit of a outsider here having never compeated... but being a new guy thats planing on joining in, I can shed some light from that perspective. As for building the sport, and adding new shooters? Its easy... Marketing. We need more clubs shooting, and more info out there to the guys that might want to give it a shot. You dont just "find out about" bullseye... you eather know about it from someone, or you dont know it exists. A new shooter has no idea what it is, what it is about, or how it works. I would suggest a thorough reading of the ISSF and USAS rules on Electronic Scoring Targets (EST). You may find that they represent a false economy in tems of volunteers, consumables, and time savings. E.g., at the USA Shooting National Championships (USASNC), a competitor will be disqualified for his third frame hit (after two warnings). Is the NRA prepared to do that at Camp Perry? The NRA will have to develop an entirely new set of rules for EST; have range officials (volunteers) trained and ready for repairs and challenges; and have ample replacements on hand for the (many, many) downrange items that wind up with bullet holes in them. Who will replace the backing targets after each series? Who will paste the holes in the white? Who will be trained to settle a challenge on shot value based on what the EST says vs. the hole in the backing target? Who will be trained to settle a claim of a cross-fire? The Camp Perry volunteers are under-appreciated and underpaid, but don't forget that each competitor also is a volunteer that performs considerable scoring and target repair duties, and pays for the privilege. 600+(?) volunteer scorers and target repairers are hard - and expensive - to replace. As an addendum: I am by no means a Luddite. I work in a field on the cutting edge of Web technologies, and I prefer shooting on electronic targets vs. paper, as a competitor. However, IMO, the switch to EST has been a contributor (albeit not the only one) to the decline of participation in international shooting in the US over the last 20 years, both in terms of the lack of facilities capable of hosting national- and international-level competition, and in discouraging local ranges from holding ISSF/USAS-style competitions. One may wish hopefully that it is a case of "if you build it, they will come," but that has not turned out to be the case in the esoteric discipline of ISSF-style pistol. I am pessimistic that it would be the case for the equally-esoteric (and significantly more conservative) discipline of conventional pistol. I have been asking around, and the common theme is if the targets don't turn, it's a different sport. DON'T REPLACE THE SPORT in order to REPAIR some worn equipment. Some of those competitors said they wouldn't go to Perry to protest the change. Analogy: there are electronic golf simulators where you hit the golf ball against an HD projector screen. Golfers can be on the most challenging courses on earth. They don't need caddies or course officials. The round of golf can take less time because the golfers don't have to walk to the ball. Even with all of that, you wont hear the PGA proposing the next US Open being held at Dave & Busters. Don't waste the money on these electronic targets. Just like John Bickar said, it will contribute to less participation. Do your promotional shoots and get the sponsors to give sponsored awards for top iron sight shooter and top revolver honors, but don't change the sport. Fix the upcoming competitions calendar website. Make it easier for new shooters to find matches. Make it so shooters receive an email when a new NRA sanctioned match is scheduled in their area. Make it so shooters can select the type of match and a number of miles they are willing to travel. But don't change the sport. We have a member on this forum that makes fantastic iPhone apps that give range commands. Hire him to program an iPhone app that controls the turning target solenoids, and make the app available to all ranges with schematics to build the same setup across the country. That will grow the sport without changing the sport. 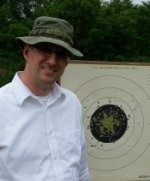 Rob Kovach wrote: the common theme is if the targets don't turn, it's a different sport. I agree with 99% of what you said, but (to quibble) there is no effective detriment to the shooter shooting with lights (EST) vs. on turning targets. Believe me, that extra 0.20 matters! That said, I think your other points about promoting existing matches, calendaring, and effective alerts outweigh that 0.2" advantage. Especially when considering the total cost of ownership of EST cf. other improvements that could be made to Camp Perry and conventional pistol at large. From what I've read and heard, the NRA, CMP, OHNG and others are doing the right things by improving the huts and ranges at Camp Perry, and I applaud those efforts. We appreciate your hard work and open ears. DirComp wrote: Now to a current topic. Pending before the Pistol Committee is a proposal to add classes of firearms to pistol competition, similar to what is used in Bianchi Cup competition. The firearms that most people are shooting today would be classified as "open" firearms. Additional classes might be "production", "metallic sight only" and/or "revolver." Any thoughts? The Pistol Committee will be discussing this on the 26th of this month so a little feedback from you would be nice. This type of approach seems to be more relevant to retaining participation in disciplines that are experiencing explosive growth, rather than increasing participation in disciplines that are stagnating. I help run a bullseye pistol league in my area, and cost of equipment does not seem to be a deterrent for participation nor for success. For quite a few years I was the top shooter in the league, shooting "metallic sight(s) only", yet newcomers continue to buy Ultradots et al. I've been trying to figure out the secret to driving participation, and the best secret I've come up with is sending an email reminder the day before each league match. That simple step has had a measurable impact. The other secret is that we have a small number of club members and league participants, less than a handful, who are chronic enablers. They proselytize and lend gear, ammo, and expertise - indiscriminately. To that point, I think local leagues are a better ladder for matches than different subclasses, etc. Maybe 40% of our league shooters shoot local 2700s; maybe 10% of those go to Camp Perry. When I lived in the Boston area, we had a very active Greater Boston Pistol League (hundreds of shooters), yet I hardly saw 4 or 5 of them at local 1800s or 2700s. I can't think of how best to do it, but if NRA were to incentivize clubs that host leagues, especially for the league organizer. It doesn't necessarily mean money. If NRA could devise a way for league organizers to easily submit league scores to NRA (Web based spreadsheets/scoresheets/recordbooks) Make it easier for the league organizers to run their leagues. Give them NRA branded promotional materials that they can leave at gun stores with club contact info as well as NRA membership info that would appeal to competitors. Use the information the match directors provide about the shooters who don't shoot in matches to recruit those shooters by sending them match bulletins for their area. I just want to remind the NRA that it's pistol shooters above all other competitive shooters who are actually NRA members. If we are serious about expanding bullseye, then we should only exert effort in ways that will expand participation. That is such a great idea!! Im not realy tech savy, but there has to be a cost effective way to be able to enter your email in at the NRA main page, and be notified of upcoming matches in a adjustable range of miles from your zip code. Who wouldn't be able to know what matches are around when you get a email dropped right in your mailbox telling you. All the guys that slip out of the sport, and just don't bother to look for them will get the little birdie tapping on their shoulder.. the new guy that's starting out will have the fire keep being lit under them every email listing new clubs they may not even know of having a match. I the software would be less then loading a few ranges with Etargets. You don't build a sport by adding new tech for the old timers already playing it. You build a sport by having the grass roots clubs getting the people that have no idea, informed!!! Kinda like the NFL saying we are going to build the sport of football buy making the ball round, and getting new goal posts.. I pretended I didn't know where to find the competition listings and tried to find them with google. You just CAN'T find them. I tried searching for NRA matches, NRA competition, you name it. NRA-start by hiring a good web developer. I-net in Milwaukee WI would be a good choice. Rob Kovach wrote: I pretended I didn't know where to find the competition listings and tried to find them with google. You just CAN'T find them. I tried searching for NRA matches, NRA competition, you name it. Yes and its VERY frustrating for a new shooter!! Then you add in the fact that its known as Bullseye shooting.... but in NRA world its called conventional pistol. I lucked out becouse I found this site and have learned a TON from you guys!! But the guys that dont spend time on web forums are pretty much out of luck. Everyone I have meet here has been more then helpfull, but untill you get that foot in the door you feel like a outsider, and bullseye a privet club. On electronic targets much good feedback posted above. I am an old guy and a huge fan of technology. That said I also see the downside as I have seen very sturdy and well made target turners destroyed by repeated hardball hits. I'd suggest if get to the point where you are seriously considering this you make several available on the practice range at Perry and get some real life feedback/experience, maybe over a couple of years. Here is why I would NOT like to see E-targets. My biggest concern is how the social aspect of the sport gets impacted. Many people love shooting bullseye because of it's social nature. During the walk to repair/replace targets you get to talk to other competitors, you get feedback and encouragement on your target, when you clean that first target you have it signed by all your friends and you take it home and hang it on the fridge. These things are a bigger part of the sport than most of us admit - don't change that. On additional classes - no - there aren't enough shooters at many local events to have a winner in the MK-HM classes let alone split it up more. At Perry where you have enough shooters a revolver only 2700 might be interesting. FYI, I'm working on a new website that will allow you to locate matches in any state, post info about your match and your club, show a map of your club's location, post club contact info, upload your scores, get new classification cards, and pay your NRA fees, all in one easy contact. Give me a little while to get this approved and up and running. I just received the legal documents today so everything is in its infancy right now.